This performance utilizes a profile from the British Pack by Selah Sounds. The specific profile we’ve used is the ‘Red MKii 3’ profile, which is a profile of a Jackson Scarlett amplifier. If you want more profiles from this pack (as well as many other awesome profile packs), please visit Selah Sounds to see their full lineup. After you extract the .zip file download, you’ll need to use Kemper’s ‘Rig Manager’ software to transfer the performance to your Kemper. 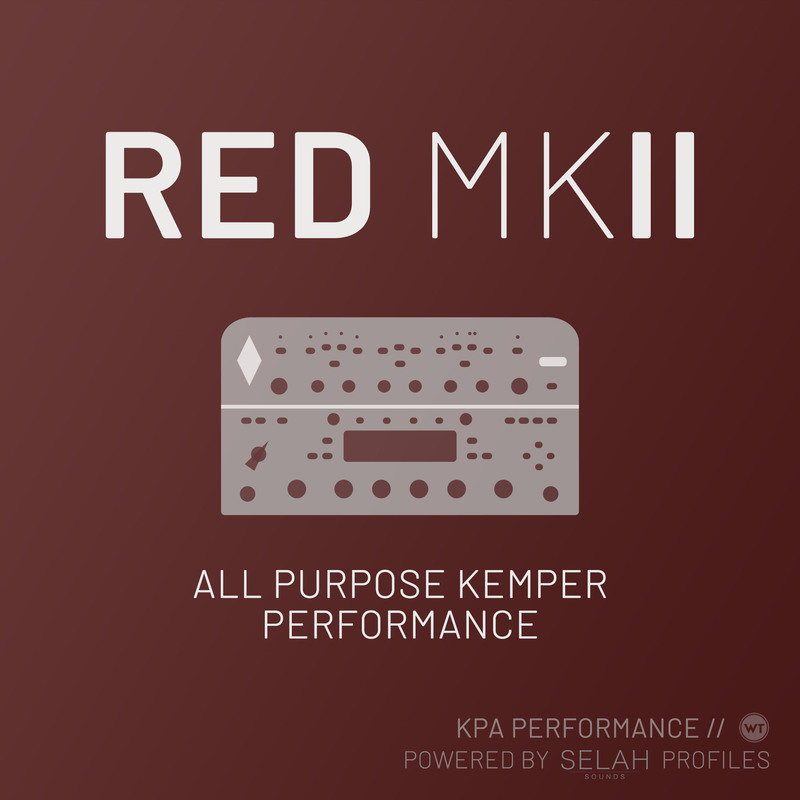 Unlike profiles, performances cannot be loaded to your Kemper using a USB drive. If you are having trouble loading the profile, drag the performance into your performance library first, and then copy/paste it into the ‘My Profiler’ section. MORPH: Morphing will increase the wetness of both the reverb and delays. The reverb goes into a big ambient verb sound, and the delays increase in both level and feedback. This slot gives you two levels of overdrive. It’s default tone is a light to medium-light level of drive (depending on how hot your pickups are). Hit the boost, and you’ve got a bit more gain on tap. This slot gives you two more levels of overdrive, both louder than the biggest setting in ‘Drive 1’. It’s default sound is a big rhythm drive tone. If it’s too much gain for your playing style, turn the boost off (Effects switch 2). EFFECTS 1: Analog Octaver (off by default) – this adds a subtle low octave that will add a lot of body to your leads. This slot can be used for volume swells or for super ambient playing (without swells). The delays and reverbs trail for a very long time – proceed with caution :). EFFECTS 1: Tremolo (off by default). EFFECTS 3: Crystal Delay (on by default) – this delay creates an awesome Shimmer reverb sound. MORPH: Morphing will increase the wetness of both the reverb and delays. The reverb morph adds more shimmer, and the delays increase in both level and feedback. We left the ‘Clean-ish’ slot pretty clean. We prefer to use ‘Drive 1’ as our base tone and play lighter (or roll back the volume) for clean sounds. You may prefer this as well depending on your playing style. We also suggest saving the slots with different effects on or off (especially delays) depending on how you like to use delay. Every slot has morph functionality. Morphing will add more wet effects (reverb and delay). In the ‘Swells’ slot, morphing will add more shimmer. All guitars are different, so you may want to make changes to suite your playing style and guitar. We set this up with a variety of guitars, including both single coils and humbuckers. ‘SC’ and ‘HB’ versions. We’ve included two separate performances. The ‘SC’ performance is voiced for single coils (using the EQ and amp sections). The ‘HB’ performance is voiced for humbuckers. You will probably want to make small changes based on your guitar and playing style, but these should get you in the ballpark. Definition and Clarity controls in the ‘Amplifier’ section. One of the best ways to tweak a profile or performance slot for individual guitars is with the ‘Definition’ and ‘Clarity’ control options in the ‘Amp’ section of the Kemper. Increasing the ‘Definition’ control will remove low end, which you may want to do if your guitar has higher output humbuckers. Increasing ‘Clarity’ will add high end, which you also may want to do with higher output humbuckers or darker pickups in general. We recommend making a copy of the performance and changing the copy just in case you want to revert back to the original.